Urban Sketchers Seattle: Working inside on a sunny day in October? Working inside on a sunny day in October? I was so sorry to miss today's USk Seattle sketching, but alas, when it rains it pours (metaphorically in this case, as what a beautiful day in October(??!!) it was--I remember sitting with Gail in the pouring rain as we sketched pumpkins a few years back...)...anyway, I am happy that it's pouring lots of work, however it did require that I chain myself to my drawing table all weekend. So, here are two sketches I did a few weeks ago, both sketched and painted on site. One, my first Huskies game, feeling obligated since we now have TWO kids at UW wearing purple. We went with our neighbors who are both UW grads, sat in the first row on the field! 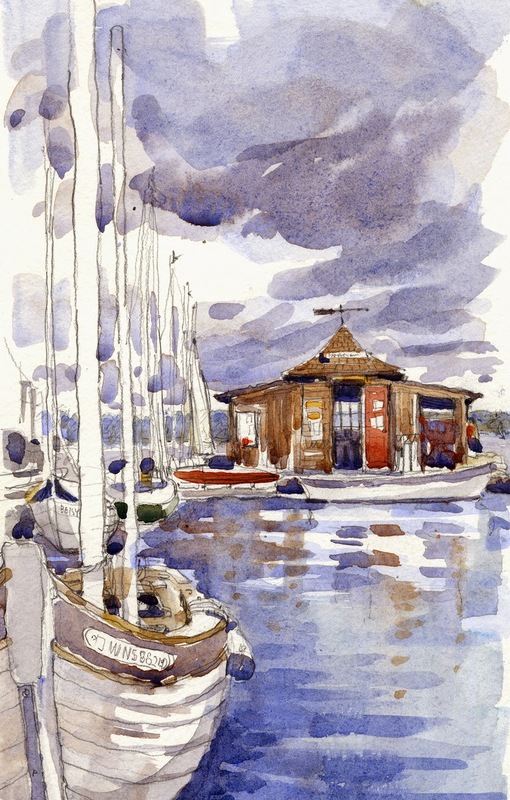 Two, was at an overcast day at the Center for Wooden Boats with my friend Beanne's Cornish class, a sketch of the quirky Oar House...I love CWB, it's like an oasis in the city, a spot that time somehow forgot. Seattle sketchers, I hope to see you in November, if not sooner! Lovely sketches and I especially love the clouds parting with the light reflecting on the water.